Can Nutritional Therapy Help Patients with Minimal Hepatic Encephalopathy? 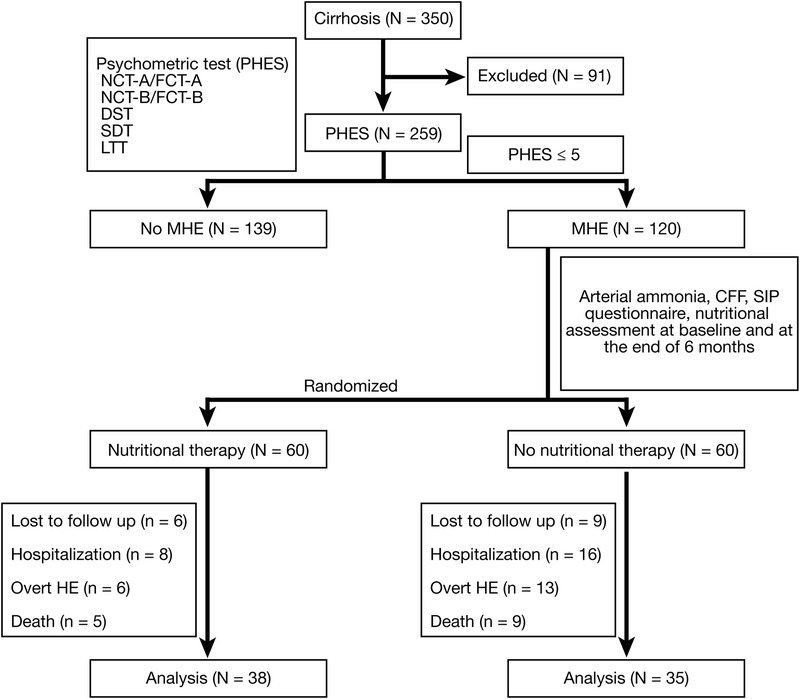 Nutritional therapy for patients with cirrhosis and minimal hepatic encephalopathy (MHE) not only improves their nutritional status, but increases cognitive function, health-related quality of life (HRQOL), and liver function and reduces hospitalization, researchers report in the March issue of Clinical Gastroenterology and Hepatology. HE is a spectrum of neuropsychiatric abnormalities that develops in patients with liver dysfunction. MHE is the mildest form of HE, characterized by neuropsychologic and/or neurophysiologic features of cerebral dysfunction without clinically overt symptoms. MHE develops in 30%–80% of patients with cirrhosis and impairs patient daily activities and HRQOL. MHE can lead to development of overt HE. Patients with MHE are poor at household work, often unfit to drive vehicles, and are more likely to be involved in a motor vehicle accident. Treatments are needed not only to improve cognition, but increase HRQOL. Patients are currently treated with lactulose, probiotics or synbiotics, or L-ornithine L-aspartate. In a study performed in New Delhi, India, patients with cirrhosis (56.3% with MHE) were randomly assigned to groups given nutritional therapy (48 men) or no nutritional therapy (47 men) for 6 months. The nutritional therapy included 30–35 kcal/kg and 1.0 to 1.5 g of vegetable protein/kg per ideal body weight/day, including casein-based dairy products, with 2 g/d salt. Patients received a dietary chart of food items to be ingested, with instructions on calorie and protein intake, nutrition education, and had monthly meetings with a dietician. Patients in the control group simply continued their same diets. After the 6-month study period, a higher proportion of patients in the nutritional therapy group had reversal of MHE (71.1% vs 22.8% of controls). Patients in the nutritional therapy group also had significantly larger increases in psychometry hepatic encephalopathy scores (3.86±3.58 vs 0.52±4.09 for controls) and HRQOL (increases in sickness impact profile scores of 3.24±3.63 vs 0.54±3.58 for controls). Overt HE developed in 10% of patients in the nutritional therapy group vs 21.7% in the control group. Nutritional parameters including mid-arm circumference, handgrip, serum level of albumin, skeletal muscle mass, and creatinine height index had also increased in the group receiving nutritional therapy. Fewer patients in the nutritional therapy group were hospitalized. Patients with cirrhosis of Child’s class C did not improve as much as as patients with cirrhosis of Child’s class B after nutritional therapy. Sudhir Maharshi et al conclude that instituting nutritional therapy at earlier stages of disease progression is the best way to maximize its benefits and prevent further deterioration. Maharshi et al state that their findings support those from a preliminary study in which 68.4% of patients showed reversal of MHE after 8 weeks of nutritional therapy. Nutritional therapy might reduce features of MHE by improving liver function, increasing muscle mass and nitrogen metabolism, and altering the intestinal microbiota. This article has an accompanying CME activity.